You just got a clean kill - now the real work begins. With a supportive external frame and removable pack, the Rail Hauler 2500 can comfortably carry the heaviest loads. The Rail Hauler's lightweight aluminum frame is designed to handle up to 200 pounds, giving you the perfect platform for hauling anything from overnight gear to an elk quarter. Wrap-around 'wings' combine with a vertical strap system to securely hold your load in place, while a folding shelf on the bottom supports the weight. 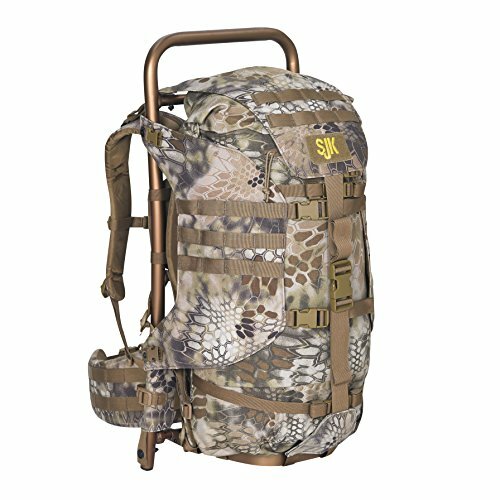 The removable roll-top pack can be used alone, or with the frame in two different carry modes - standard, with the pack close to your back, or in 'trophy carry' mode with space to haul gear between the frame and the bag. Versatile weapon carry system easily handles rifles or bows and stows away when not in use. Kryptek multi-level camo pattern gives you the latest in concealment technology. If you have any questions about this product by Slumberjack, contact us by completing and submitting the form below. If you are looking for a specif part number, please include it with your message.